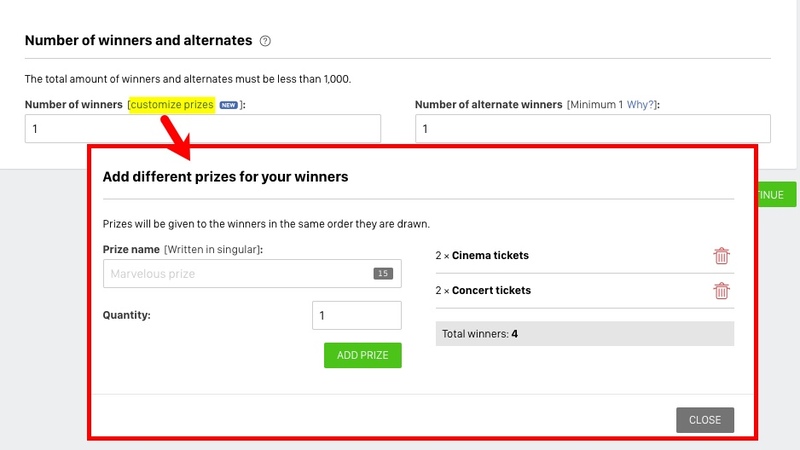 Now the giveaway administrator can create different prizes in the giveaways and enter the number of winners and alternate winners to select. Example: First prize is cinema tickets for two winners, and second prize is concert tickets for 2 winners. This includes that when publishing the winners, they will be presented separately. 2. Present the result of the giveaway in "Broadcast Mode"
This option allows you to present the result of a giveaway in a dynamic format to make the announcement of the winners more entertaining and add surprise and fun to your giveaways. Furthermore, it lets you download a video of the broadcast to easily share on social media. See example. Note: This option is only available with a Basic PRO plan or higher. Check out how the Broadcast Mode works and how to use it in your giveaways. The giveaway administrator has the option of activating a visual, more graphic, presentation of the winner selection to add excitement to the giveaway. Note: This option is available for all Easypromos accounts, also in the free giveaways. Accounts with a Basic PRO plan or higher can additionally edit the visual presentation in the "Broadcast Mode" feature and download it to share on social media. 1. New interface. The configuration and management interface of the giveaways has been redesigned. 2. The default share image has a new design. The Winners page comes with a default image which is used when the Winners page and the "Broadcast Mode" is shared. The administrator can change this image.